Inspired by a life-long love of fabric and sewing, Karen began to passionately pursue quilt making in 1997. Karen designed and created custom, commemorative quilts on a commission basis for more than 10 years, allowing her to help families preserve their treasured memories and celebrate the special moments in their lives. Teaching workshops featuring her techniques, Karen encourages her students to add their own personal touch to each project and embellish with abandon. 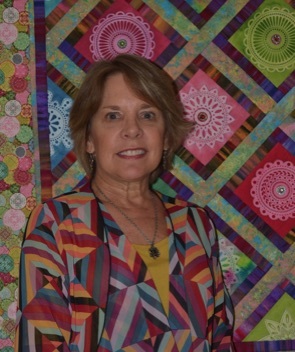 Karen's lectures and trunk shows inspire quilters to express their creativity and embrace an artful life. Dedicated to educating and encouraging quilters, artists and designers of all ages and abilities, Karen’s classes are offered locally at A Different Touch in Chesapeake, VA.
A Chicago native, Karen currently resides in Virginia Beach, VA with her husband, Tad, and brings her creations to life in her home studio. and colorful work with your group!